The QB STEP OVER is specially designed to meet the needs of the QB position. 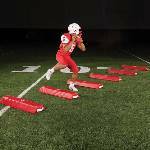 Low profile shape avoids high vertical lift and allows QB's to pick up and reset feet quickly. Use it to improve footwork and the rhythm of the drop without compromising upper body mechanics. Gain distance and speed with your drop while keeping your upper body balanced and compact. Execute a 3, 5 or 7 step drop while stepping over the bags. Excellent for sprint out agilities. Measures 4" thick by 12" wide by 40" long. Aerodynamic shape increases the speed of the drill and reduces the risk of tripping. Also recommended for offensive lineman because low level "foot fire" is essential for proper technique. "The coaching point is to improve footwork and the rhythm of the drop without compromising upper body mechanics!"